21 December 2014 - “None of us,” Bruce Cockburn writes near the end of his newly released autobiography, “has the capacity to stand far enough back from the picture to see how the parts of our lives intersect. We’re all tiny figures in the jigsaw flux…"
In music circles, a cry of Bruce! will probably, most often, lead the listener to infer Springsteen as the implied last name. There’s a huge contingent of music fans though for whom the name is equally likely to evoke Cockburn. In some contexts, the latter might be the first to come to mind. Cockburn’s reputation as a songwriter has long since passed to legendary status. It seems fitting in a world where a barely 20 Justin Bieber publishes a “memoir” that a man with Cockburn’s lasting power and influence pen one too. If there is any mercy in the world, the latter will outsell the former. Cockburn’s look at the picture of his life is extensive and full of pieces well told. The book is a framework in which the singer tells the origin tales of many of his songs, and those lyrics appear here as well. To accompany the book the legendary True North label has released a 9 CD box set (including a disk of rare and previously unreleased material) of the same name as a sort of accompaniment to the book. All told, the book and compilation paint an extensive portrait of Cockburn’s life in and out of music. Rumours of Glory doesn’t see Cockburn shy away from his reputation as a political activist. The book is more than a chronological romp through his career, and if you’re not familiar with the politics of Central America the book will serve as a decent overview of the last thirty years or so. Cockburn reminisces about many trips to that region with various non-governmental agencies, and makes it clear that he was not a fan of pretty much any U.S. President from Reagan onwards. He tells the story of playing a Clinton victory party with Roseanne Cash where, for him, the most exciting moment was being introuduced to both Jonny and June. The smile on his face when Johnny shake his hand fad says “Nice playin’ son” practically beams from the page. Sadder is his description of a visit to Cambodia’s Tuol Sleng, a high school that was used by the Khmer Rouge as a toture site during their horrific reign. “Tuol Sleng is a black hole that sucked all human goodness into it, leaving an event horizon of pure evil that chills the heart of everyone who goes there." Cockburn does a nice job of telling the tales behind songs he’s written. “What doesn’t kill you makes for songs” he says in describing a year long hiatus he took from performing which led to some fruitful songwriting. He describes the subsequent album Breakfast in New Orleans Dinner in Timbuktu as reflecting “…in a time-lapse manner, the slow unfurling of a life…” and book behaves in much the same way. Not much seems to be held back. There are stories of relationships pursued and lost, of working with T. Bone Burnett, of a daughter whose life as a teenager seemed to be spiralling out of control (but soon regains its path,) and of visits to war zones. Cockburn lays the trials of his life on the page and the result is a compelling read for any fan of songwriting. The 9 CD of the same name released by True North records contains 117 of Cockburn’s songs in addition to a DVD of concert footage recorded in 2008 an extensive book of liner notes. Each set is autographed and numbered, which means if you know a Cockburn fan there’s probably not a better gift to get them. More importantly, the box stands as a comprehensive document of one of the most compelling careers in mainstream music. It’s collection of songs ranges from the obscure to the well known and in doing so it achieves more than just being a greatest hits collection (of which there have been several released already.) The disc of unreleased material includes a Gordon Lightfoot cover, as well as selections from Cockburn’s soundtrack for the NFB film Waterwalker. As usual with an artist of this caliber and integrity, it’s amazing to listen to the stuff that wasn’t good enough to make an album at times. As a songwriter Bruce is almost without equal. His output rival’s Dylan’s in its quality and is arguably better in its consistency. 1979’s Wondering Where the Lions Are remains the greatest song to ever come out of Canada (and the only one, he posits, to ever make the Billboard Charts with the word ‘petroglyphs’ in it) but it’s rivalled by later career works like Last Night of the World and Pacing the Cage. Despite having recorded 31 albums, Bruce hasn’t lost his passion for what he does and that shows in his recent output. Rumours of Glory as both a book and a music compilation is a long overdue capsule of a career. 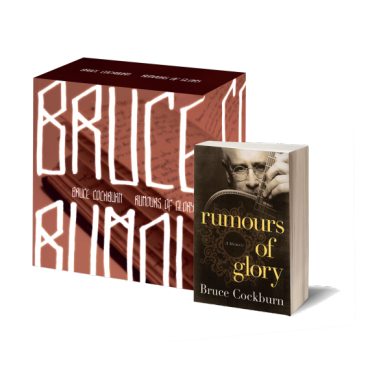 You can order Rumours of Glory directly from True North Records in various configurations, including a box set and book bundle. Naturally you can also order the book from Amazon if you really want too. 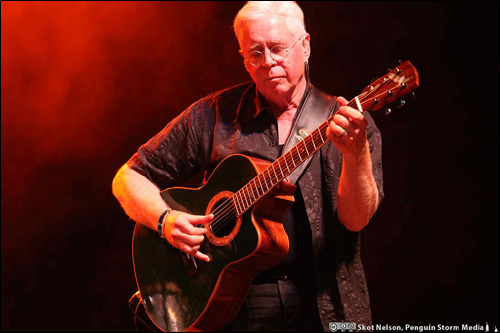 ~from NoDepression.com - Bruce Cockburn Rumours of Glory - book and album review by Skot Nelson.